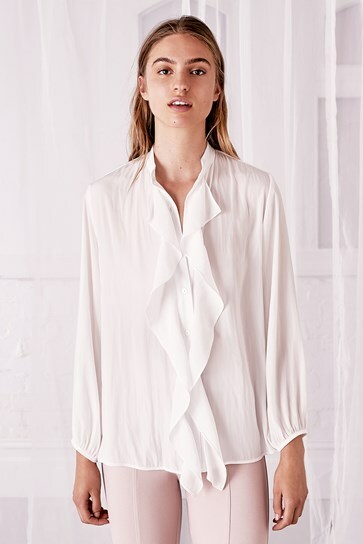 Move from day to evening in this gorgeous shirt with ruffled waterfall front with button detail. Made from our signature Japanese Technical fabrication with its superior wicking technology this shirt is super lightweight and perfect for travelling.Cool gentle wash. Wash separately first wash. DO NOT bleach, soak, wring or tumble dry. Cool iron on reverse side using iron cloth. Line dry in shade. Drycleanable. Exposure to rubbing or rough surfaces may cause pilling..